Want to get started in ice fishing but don’t have clue where to begin? Pull up a chair — class is now in session. Let me make a bold statement: No outdoor activity has changed more in the last 35 years than ice fishing. The reason? Equipment geared specifically toward making you more efficient and effective on the ice. In the old days, ice anglers drilled or chopped holes in the ice, guessed the depth (or checked it with a line and sinker), guessed at the depth of the fish, sat on a 5-gallon pail, dropped a line with a small bobber in the hole and then stared at the slush. They hoped, shivered — and probably drank. Today, thanks to ice fishing pioneers such as Dave Genz, we no longer have to sit and hope. Modern ice fishing is a high-tech video game, and you don’t have to freeze your fanny to play. 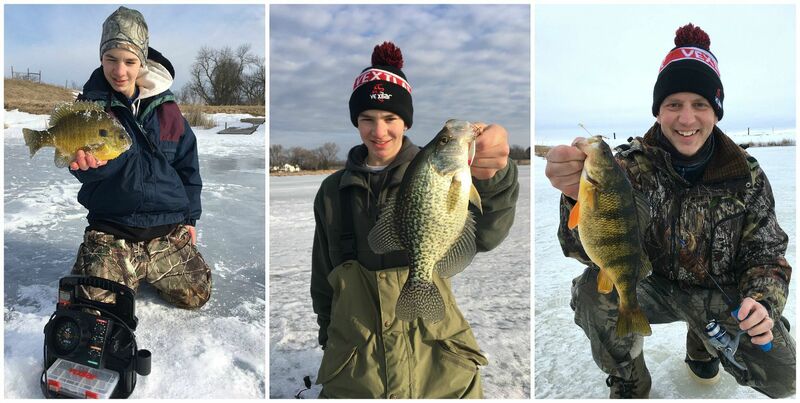 Many species of gamefish feed aggressively during the frozen-water period, including sunfish (left), crappies (center) and perch (right). What type of gear do you need to get in the game? Below are the four most critical components. Sure, you can spend hundreds of dollars on the latest-and-greatest power ice augers, but all you really need to get started is a simple and affordable hand auger. The key is buying an auger that cuts a 6-inch-diameter hole; any larger than that makes for more work. And 99 percent of the fish you’ll hook will easily slip through a 6-inch hole. My favorite is the Mora 6-inch Ice Auger; street price is $50-$55. Electronics play a vital role in fishing success during open-water periods, and believe it or not, electronics are even more important during ice fishing season. I am not exaggerating here, If I couldn’t bring my fishfinder on the ice, I’d stay home. And here’s the good news: You don’t have to spend thousands. 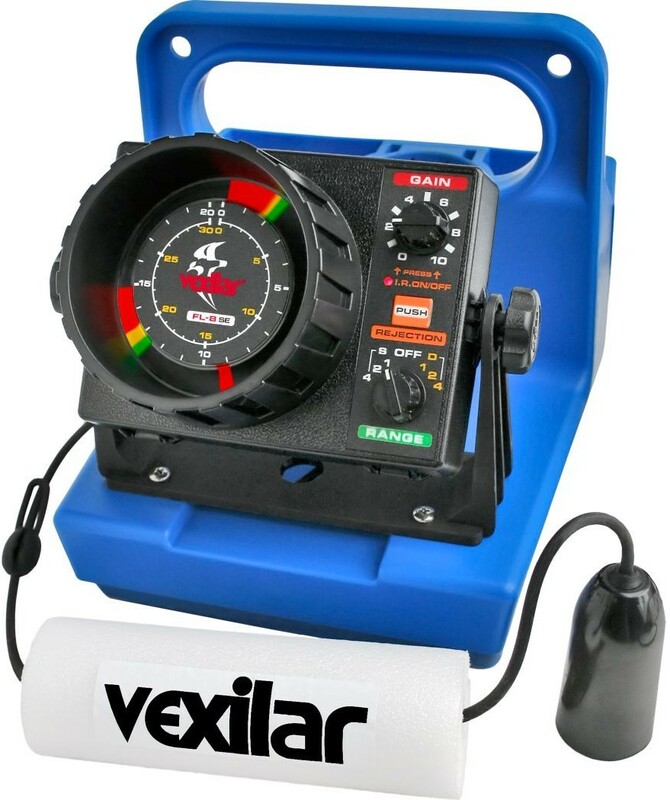 I recommend you purchase a flasher-style unit such as the Vexilar FL-8SE Genz Pack. Lowest price I could find online is $280. I’ll save a detailed explanation of how the unit works for a future article, but here’s the headline: You can not only see the bottom/depth indicated on the flasher screen, but you can see fish and your lure. This is the video game I mentioned earlier. Let’s say it’s 20 feet deep, and you’re holding your lure at 19 feet, planning to catch a perch near the bottom. Suddenly, you see a signal on the flasher indicating a fish at 13 feet. You wind your line to 13 feet; the readout on the flasher is instantaneous. The fish, a crappie probably, sees your lure and then inhales it. As you unhook the crappie, another fish/signal appears at 12 feet on your flasher. You quickly lower your lure, seeing it the entire time on your flasher, to 12 feet and tease that crappie into biting as well. This is important too; If you don’t see any fish on the screen after 10-15 minutes, you know nothing is there. You can move until you find fish. It’s a deadly system. The days of lower and raising your lure hand-over-hand are over. You don’t fish that way during summer, so why do it during winter? Assuming you’ll be most interested in catching sunfish, crappies and perch, buy an affordable but sensitive rod-and-reel combo. One of my favorites is the 25-inch UL (ultralight) Dave Genz Spring Bobber combo. Cost is $40. This rod features a spring bobber, which is small, sensitive piece of metal on the rod tip that will show you the lightest strikes. You won’t always need a spring bobber to detect strikes, but when panfish are super-finicky, it makes a tremendous difference. Fill the spool with 4-pound-test monofilament and you’re good to go. The sensitive piece of metal at the end of the Genz fishing rod is called a spring bobber. Note: You don’t use an old-school bobber attached to your line; the spring bobber on your rod tip will show you strikes, and you need the freedom to raise and lower your lure quickly based on what your flasher is telling you. Sure, some calm/warm winter days you can get away without an ice shelter, but most of the time you’ll catch far more fish in a controlled environment. Using a gas lantern for heat (and a light source after sunset), you can keep a one-person shelter toasty-warm. You won’t have to worry about ice forming on your line or in your hole. You won’t need gloves. You can even remove your warm winter coat. In addition, a shelter keeps wind off your line, which makes it easier for you to detect strikes. Finally, you can control the amount of light inside the shelter during the day by covering windows; having it a bit dark makes it easier to see the signals on your flasher. You can spend a lot of money on a shelter (bigger = more money), but I recommend a one-person model with a thermal fabric (think warm) like the Clam Outdoors Blazer Stealth. You can buy one for as low as $320, and it’ll last forever. 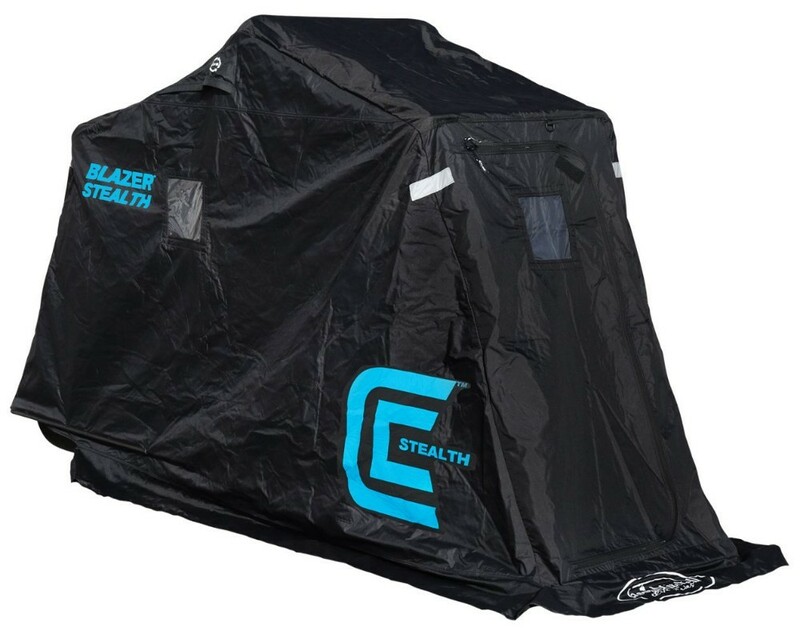 The Clam Outdoors Blazer Stealth is an ideal one-man ice fishing shelter. As you get more serious about ice fishing, you’ll certainly add more gear, but the four items I’ve detailed here will always be part of your winter arsenal. Be safe and have fun!